Ship Pal Gae Forms are soft and hard. These forms develop flexibility, coordination, strength, and speed. The mind, body, and weapons must come together as one. Strong eye contact is maintained with the opponent, and movements are usually offensive. The hands and feet are used in all different directions, with both angles and circles. Weapon and body combine as one. Breathing and movement harmonize together. Practice speed is a combination of fast and slow body movements. Body movements and breathing control must be coordinated together. The weapon’s direction and proper body position must be coordinated together as one. If the weapon moves one direction and the body another, injury will result. Hard and soft movement of the weapon and the body must be properly timed. With proper practice, accuracy of the weapon strike will develop. At the intermediate level of practice, the choice of weapons must be properly matched to the individual’s body. 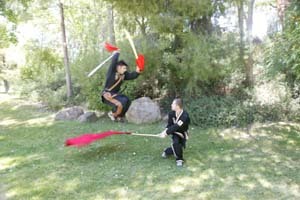 For example, it is improper for someone with a small body to practice with a Chung Yun Doe or Chong Bong. The correct choice of weapon would usually be the Doe or Kom because it is easier for a smaller person to handle. Someone can still practice with these weapons to understand the correct movements; however, it would be improper to specialize in these weapons. When a practitioner achieves harmony with the weapon (the practitioner and the weapon become one), tremendous benefits will be derived to both the mind and body. Tan Bong Wood or steel stick, approximately two feet long with a braided silk fabric tassel at the top. Chong Bong 6-foot long wood or steel pole. Tan Chu Chuck Bope Two wood or steel sticks with a chain in between. Note: Once achieved, one is capable of performing Sam Pyo Chung. Jang Chu Chuck Bope Two 2-foot sticks with a chain in between, or three 2 1/2 foot sticks with chains in between. 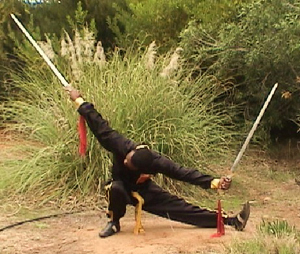 Sang Kom Double Chinese sword (two swords). Doe (Chinese Sword) Straight, double-edged blade and a sharp point. Sang Doe (Double Chinese Sword) Two of the same weapon. Straight double-edged blade and a sharp point. Chang Sool Wood or steel pole with sharp point and blade at the end (6-foot long). Pyo Kom 3 1/2 foot steel pole with a hook on one end, a point on the other. It has a handle 1/3 the way down its length, with 1/4 moon blade over the handle. 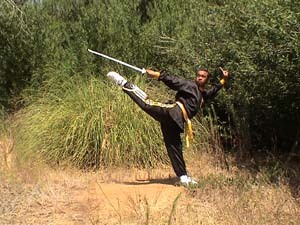 Sang Pyo Kom (Two Pyo Kom) – Double sword with 3 1/2 foot steel pole with a hook on one end, a point on the other. It has a handle 1/3 of the way down its length, with 1/4 moon blade over the handle. Sang Chul Quan Single-edge Chinese sword with several rings on the blade. Bu Chae Chinese fan with steel spikes. Chung Yun Doe Steel pole, 4-foot long, with Chinese sword at the end that has one ring on the blade. Dok Chim Sui Sa Sul 6-foot steel chain with a heavy weighted point. Mae Hwa Kom Bope Sword (Kom) technique with the grace of a woman and the strength of a tornado. Shin Doe Kom Bope Sword (Kom) technique with lightening fast movement. NOTE: If someone absorbs the 18 traditional Moo Doe weapons listed above, they can properly perform any weapon known throughout history.